In transmitting President Richard Nixon’s orders for a “massive” bombing of Cambodia in 1969, Henry Kissinger said, “Anything that flies on everything that moves”. As Barack Obama wages his seventh war against the Muslim world since he was awarded the Nobel Peace Prize, and Francois Hollande promises a “merciless” attack on that ruined country, the orchestrated hysteria and lies make one almost nostalgic for Kissinger’s murderous honesty. According to Pol Pot, his movement had consisted of “fewer than 5,000 poorly armed guerrillas uncertain about their strategy, tactics, loyalty and leaders”. Once Nixon’s and Kissinger’s B-52 bombers had gone to work as part of “Operation Menu”, the west’s ultimate demon could not believe his luck. The Americans dropped the equivalent of five Hiroshimas on rural Cambodia during 1969-73. They leveled village after village, returning to bomb the rubble and corpses. The craters left giant necklaces of carnage, still visible from the air. The terror was unimaginable. A former Khmer Rouge official described how the survivors “froze up and they would wander around mute for three or four days. Terrified and half-crazy, the people were ready to believe what they were told… That was what made it so easy for the Khmer Rouge to win the people over.” A Finnish Government Commission of Inquiry estimated that 600,000 Cambodians died in the ensuing civil war and described the bombing as the “first stage in a decade of genocide”. What Nixon and Kissinger began, Pol Pot, their beneficiary, completed. Under their bombs, the Khmer Rouge grew to a formidable army of 200,000. ISIS has a similar past and present. 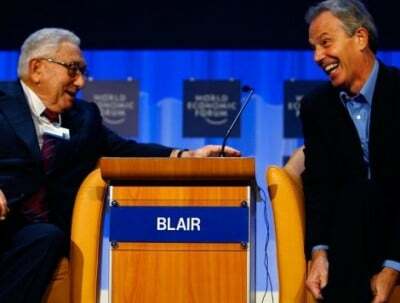 By most scholarly measure, Bush and Blair’s invasion of Iraq in 2003 led to the deaths of at least 700,000 people – in a country that had no history of jihadism. The Kurds had done territorial and political deals; Sunni and Shia had class and sectarian differences, but they were at peace; intermarriage was common. Three years before the invasion, I drove the length of Iraq without fear. On the way I met people proud, above all, to be Iraqis, the heirs of a civilization that seemed, for them, a presence. ISIS is the progeny of those in Washington, London and Paris who, in conspiring to destroy Iraq, Syria and Libya, committed an epic crime against humanity. Like Pol Pot and the Khmer Rouge, ISIS are the mutations of a western state terror dispensed by a venal imperial elite undeterred by the consequences of actions taken at great remove in distance and culture. Their culpability is unmentionable in “our” societies, making accomplices of those who suppress this critical truth. It is 23 years since a holocaust enveloped Iraq, immediately after the first Gulf War, when the US and Britain hijacked the United Nations Security Council and imposed punitive “sanctions” on the Iraqi population – ironically, reinforcing the domestic authority of Saddam Hussein. It was like a medieval siege. Almost everything that sustained a modern state was, in the jargon, “blocked” – from chlorine for making the water supply safe to school pencils, parts for X-ray machines, common painkillers and drugs to combat previously unknown cancers carried in the dust from the southern battlefields contaminated with Depleted Uranium. Just before Christmas 1999, the Department of Trade and Industry in London restricted the export of vaccines meant to protect Iraqi children against diphtheria and yellow fever. Kim Howells, parliamentary Under-Secretary of State in the Blair government, explained why. “The children’s vaccines”, he said, “were capable of being used in weapons of mass destruction”. The British Government could get away with such an outrage because media reporting of Iraq – much of it manipulated by the Foreign Office – blamed Saddam Hussein for everything. In 2007, the senior British official responsible for the sanctions, Carne Ross, known as “Mr. Iraq”, told a parliamentary selection committee, “[The US and UK governments] effectively denied the entire population a means to live.” When I interviewed Carne Ross three years later, he was consumed by regret and contrition. “I feel ashamed,” he said. He is today a rare truth-teller of how governments deceive and how a compliant media plays a critical role in disseminating and maintaining the deception. “We would feed [journalists] factoids of sanitised intelligence,” he said, “or we’d freeze them out.” Last year, a not untypical headline in the Guardian read: “Faced with the horror of Isis we must act.” The “we must act” is a ghost risen, a warning of the suppression of informed memory, facts, lessons learned and regrets or shame. The author of the article was Peter Hain, the former Foreign Office minister responsible for Iraq under Blair. In 1998, when Denis Halliday revealed the extent of the suffering in Iraq for which the Blair Government shared primary responsibility, Hain abused him on the BBC’s Newsnight as an “apologist for Saddam”. In 2003, Hain backed Blair’s invasion of stricken Iraq on the basis of transparent lies. At a subsequent Labour Party conference, he dismissed the invasion as a “fringe issue”. Here was Hain demanding “air strikes, drones, military equipment and other support” for those “facing genocide” in Iraq and Syria. This will further “the imperative of a political solution”. The day Hain’s article appeared, Denis Halliday and Hans Von Sponeck happened to be in London and came to visit me. They were not shocked by the lethal hypocrisy of a politician, but lamented the enduring, almost inexplicable absence of intelligent diplomacy in negotiating a semblance of truce. Across the world, from Northern Ireland to Nepal, those regarding each other as terrorists and heretics have faced each other across a table. Why not now in Iraq and Syria? Instead, there is a vapid, almost sociopathic verboseness from Cameron, Hollande, Obama and their “coalition of the willing” as they prescribe more violence delivered from 30,000 feet on places where the blood of previous adventures never dried. They seem to relish their own violence and stupidityso much they want it to overthrow their one potentially valuable ally, the government in Syria. The only effective opponents of ISIS are accredited demons of the west – Syria, Iran, Hezbollah and now Russia. The obstacle is Turkey, an “ally” and a member of Nato, which has conspired with the CIA, MI6 and the Gulf medievalists to channel support to the Syrian “rebels”, including those now calling themselves ISIS. Supporting Turkey in its long-held ambition for regional dominance by overthrowing the Assad government beckons a major conventional war and the horrific dismemberment of the most ethnically diverse state in the Middle East. A truce – however difficult to negotiate and achieve – is the only way out of this maze; otherwise, the atrocities in Paris and Beirut will be repeated. Together with a truce, the leading perpetrators and overseers of violence in the Middle East – the Americans and Europeans – must themselves “de-radicalise” and demonstrate a good faith to alienated Muslim communities everywhere, including those at home. There should be an immediate cessation of all shipments of war materials to Israel and recognition of the State of Palestine. The issue of Palestine is the region’s most festering open wound, and the oft-stated justification for the rise of Islamic extremism. Osama bin Laden made that clear. Palestine also offers hope. Give justice to the Palestinians and you begin to change the world around them. More than 40 years ago, the Nixon-Kissinger bombing of Cambodia unleashed a torrent of suffering from which that country has never recovered. The same is true of the Blair-Bush crime in Iraq, and the Nato and “coalition” crimes in Libya and Syria. With impeccable timing, Henry Kissinger’s latest self-serving tome has been released with its satirical title, “World Order”. In one fawning review, Kissinger is described as a “key shaper of a world order that remained stable for a quarter of a century”. Tell that to the people of Cambodia, Vietnam, Laos, Chile, East Timor and all the other victims of his “statecraft”. Only when “we” recognise the war criminals in our midst and stop denying ourselves the truth will the blood begin to dry.